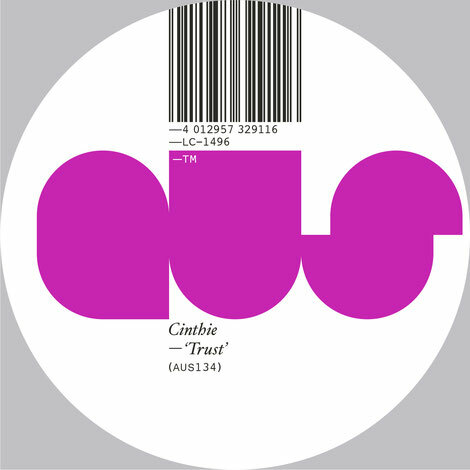 Cinthie joins the roster of Aus Music this month with her ‘Trust’ EP, comprising three original cuts from the Berlin artist. Founder of several imprints, namely Beste Modus, we_r_house and 803 Crystalgrooves, as well as her own label collective and record store brand Elevate, native Berliner Cinthie has possibly became a highly respected figure in electronic music in her hometown and across the globe over the past few years. Most notably known for her long standing as a DJ primarily, recent months have seen Cinthie build her own studio and dedicate much of her time to crafting the music she’s always longed to. This new EP for Will Saul’s Aus Music is a product of this time spent and marks the next phase for Cinthie’s productions. Title-track ‘Trust’ leads on the package, fuelled by a marimba style percussive melody, building strings and a bumpy bass hook whilst crunchy drums and arpeggio leads further fuels the emotive feel. ‘Lost At Sea’ follows next, employing a loosely flowing organic drum groove, jazzy Rhodes chords and resonant moog style synth licks to create yet another twist on contemporary house music. ‘Hip Swing’ then rounds out the package on a deeper tip with heavily swung, up-tempo drums at the forefront whilst murky bass reverberations, choppy stabs and pads subtly ebb and flow in the depths.